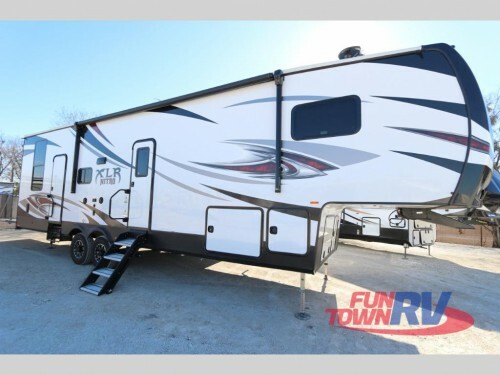 Take luxury and adventure everywhere you go with the Forest River Nitro toy hauler fifth wheels for sale here at Fun Town RV! Each of the five floorplans available will feature up to three slides and will have room for up to five people as well as a fully convertible garage. Let find out all about this RV in this Forest River Nitro toy hauler fifth wheel review! Check out our Forest River Nitro Toy Hauler Fifth Wheels! As we already mentioned, the main feature of the Forest River Nitro that sets it apart is the completely convertible cargo area. 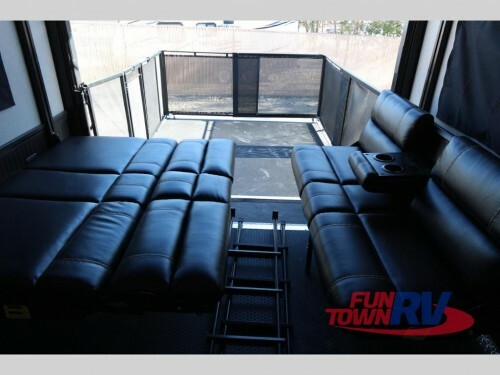 With an easy lift ramp door, 1” rubber flooring, and dual Happi-Jac beds, this space will be ideal for hauling your toys as well as adding more space for extra people. Never choose between more friends or more fun again! The convertible cargo area will make room for everything. With a 102” wide body construction, these toy haulers will have plenty of space for superior luxury amenities in each and every room. 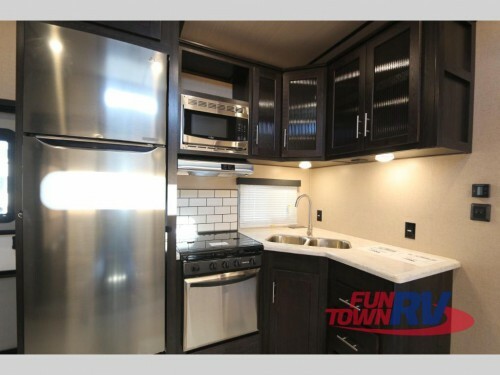 Enjoy a full height ceiling, large LCD TV, all stainless steel appliances, LG solid surface countertops, power recliners with USB chargers, and so much more for perfection in comfort. There will even be construction extras like the high efficiency A/C duct system and satellite prep to make your stay at the campground better than ever. The spacious interior provides space for luxury amenities. However, the high quality amenities do not just exist on the inside of the Nitro but will continue to the exterior. After days spent riding dirt bikes or on the water in a canoe, you will appreciate the convenience of the hot and cold exterior shower that lets you get clean before ever stepping foot inside the camper. And then be sure to relax under the electric awning with LED lighting and recoup from the day’s adventures. Want fun and comfort together? Well look no further than our Forest River Nitro toy hauler hauler fifth wheels. To learn more about how you can get the best of both worlds, be sure to contact us or come by any of our locations today!